But even if you were learning at your maximum rate, the opportunity cost argument actually works in favour of the multi-disciplinary approach. Design and its component practices are like any other craft: you can always develop a deeper familiarity with the minutiae, asymptotically approaching mastery. But this is a process with diminishing returns. Would you rather carve a door 1% better than you did last year, or learn how to build the rest of the house in the same amount of time? As I argue below, the connective tissue between these skills may actually be more valuable than incremental gains in a single practice. 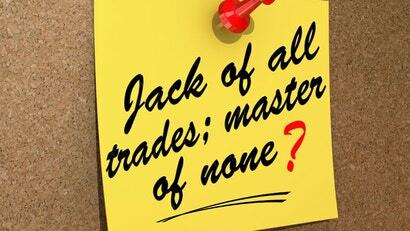 As someone who aspires to the "jack of all trades" mentality, I feel that you can become a master of many. Sure, being expert in one field is great, as long as you accept the diminishing returns that go with the more time you invest in that one field. Once you past a certain threshold in expertise in a number of areas, skills you build can be transferred into something new, giving you a head start in more areas, the more skills you learn. While I only know how to speak one language, I've been told that once you learn 2-3 languages, it becomes progressively easier to learn more (assuming they share the same roots). Be a Jack of all trades, and master of some! I totally agree. My job is a fairly sedantary IT one, so people are kind of surprised when I get stuck in to pretty much anything and everything that I feel I might be able to do, most of them far outside normal "geek" territory. I probably picked a lot of that up from my dad. In part, I learn a lot of skills to save money (saved a mate the $4000 he'd been quoted to fell a huge tree recently), but mainly because I love to learn new skills. If you're not learning something new, what on Earth are you doing? The same old thing day after day? No thanks.